There's a lot to like about Hotspot Shield, especially its ease of use and raw speed, but logging concerns and the inability to manually set up devices like routers will be an issue for some. AnchorFree's Hotspot Shield Premium is the commercial edition of the company's hugely ad-sponsored VPN service. Paying to upgrade gets rid of the ads and gives you unlimited data transfer and full access to Hotspot Shield's locations and features. There's app support for all the main platforms - Windows, Android, iOS, Mac - but as Hotspot Shield now only uses its own proprietary Catapult Hydra protocol, there's no way to set it up manually on routers or other platforms. You must use one of the apps. You can at least use a bunch of your devices at once, as Hotspot Shield Premium supports up to 5 simultaneous connections. That's better than ExpressVPN's three connection limit, although if you really need more, IPVanish allows up to 10. All the available servers are P2P-friendly, and with no bandwidth limits, you're able to browse, stream or download as much as you like. Improvements since our last review include an easier setup process after purchasing Hotspot Shield, wider chat support, and what the company calls 'integrated in-app solutions' to allow users to securely access Netflix from anywhere in the world. Although this wasn't available during our current review, AnchorFree says users will soon be able to choose city-level locations, as well as individual countries. Hotspot Shield Premium is more expensive than most VPNs, but does at least give you plenty of options, with no less than four plans. A monthly billing option costs $12.99, placing it very much at the expensive end of the market. Private Internet Access' monthly plan is more reasonable at $9.99, and even a premium VPN such as ExpressVPN is fractionally cheaper at $12.95. Extending your subscription gets you much better deals, though. Opting for the 6-month plan drops the price to $8.99 a month, while annual billing cuts it to a reasonable $5.99 per month, and paying three years up-front sees this fall to just $3.49. 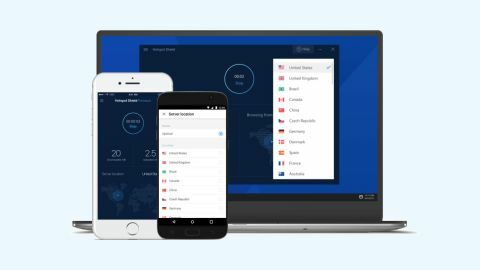 There are better deals around - NordVPN's three-year deal costs just $2.99 a month - but Hotspot Shield is competitively priced, and in the range you would expect for a decent VPN. There's no support for paying by Bitcoin, but you can use a range of other methods, including cards, PayPal, and (for extra anonymity) gift cards from hundreds of companies. Understanding a VPN's security usually starts by looking at its protocol support, encryption and authentication details. This can be hugely complicated, but just seeing that a service supports a secure protocol like OpenVPN can give you reassuring feedback about its safety. Hotspot Shield is more difficult to assess, because it doesn't support OpenVPN, or IKEv2, or L2TP/ IPSec, or any of the other standard VPN protocols. Instead it uses its own proprietary Catapult Hydra technology. This isn't as worrying as it might sound. Catapult Hydra's focus is on improving performance, and the encryption side of the protocol uses much the same standards as everyone else. For example, the Hotspot Shield website reports that Catapult Hydra is based on TLS (Transport Layer Security] 1.2, with AES-128 encryption, 2048-bit RSA certificates for server authentication and keys exchanged via Elliptic Curve Diffie-Hellman (ECDHE) for perfect forward secrecy (keys last for only one session, with new ones generated next time.) Which, for non-encryption geeks, is more than good enough ot keep you safe. One problem with proprietary technologies like Catapult Hydra is there's no easy way to see what else is going on. OpenVPN is open source and any developer can look at the code, figure out how it works, perhaps find problems or suggest improvements, something which isn't possible here. Privacy isn't just about the low-level technicalities. Client implementation is also important, especially when it comes to blocking DNS and WebRTC leaks which might give away your real identity. Fortunately, testing Hotspot Shield's clients and browser attachments at IPLeak and DNSLeakTest didn't reveal any issues, with the service protecting us from snoopers at all times. Your IP address could also leak if the VPN connection suddenly drops, at least in theory. Some of Hotspot Shield's apps include a kill switch to prevent this by shutting down your internet until the VPN is back up, but does this really work? We ran some quick tests on the Windows client, and found it generally coped very well. If the connection dropped, the client alerted users almost immediately, and tried to reconnect. Even with the kill switch turned off, our IP address was exposed for typically no more than a couple of seconds. When we turned the kill switch on, our IP address wasn't visible at all. Hotspot Shield makes apparently definitive no-logging claims on its website. A support page, for instance, states that "We do not collect any personally identifiable information on Hotspot Shield. We do not collect, store, or share any permanent identifiers of users, including IP addresses. We do not keep any activity logs for any of our users, whether they are free or Premium." "When you launch the Hotspot Shield app, before you connect to the VPN, we and our service providers collect device-specific information, such as the unique mobile ID, hardware model, operating system version, language, and network information. We may also use, but never log or store, your IP address to derive your approximate (city-level) location. We use this information to provide and improve the Services, troubleshoot, and perform analytics on our services. Our service providers may collect IP addresses for marketing attribution purposes." Hotspot Shield says it doesn't 'log or store' your IP address, but the company doesn't rule out others doing that when you launch the app. In addition, both Hotspot Shield and its service providers may log enough detail to tie these records to a specific device, and perhaps maintain a history over time (presumably they could store the city-level location of that device, every time it connected to the service). None of this can directly tie you to a specific online action, but it's still a little more logging than you might expect. Hotspot Shield makes big claims about the performance of its Catapult Hydra protocol, but does it live up to the hype? We checked the service out with Netflix' Fast, Speedtest and other websites to find out. Connecting to our nearest UK location returned speeds of around 68 to 70Mbps, all we could expect from any VPN on our 75Mbps fiber broadband test line. If your connection is faster there's a good chance you'll get more. Reaching out to close European locations - Netherlands, France, Germany - made barely any difference at all, with speeds of around 65 to 70Mbps. Connecting to the US saw our download speeds barely change at all, at around 60-65Mbps, a significant improvement on our last full review. Oddly, many of Hotspot Shield's more distant servers were even faster, with Brazil, India, Japan and Singapore all averaging around 65-70Mbps. Switching to Australia finally saw speeds drop, though only to around 55-65Mbps, which still tramples all over just about everybody else. These are stellar results, both for top speeds and consistency, especially for the most distant locations. If you plan to regularly connect to faraway servers, Hotspot Shield just might be one of the best VPNs around. Connecting to a VPN can help you bypass all kinds of website restrictions, from streaming sites which block content in specific countries, to countries such as China which block a host of popular sites. Measuring a VPN's unblocking abilities is difficult as there are so many factors involved, but we try to get a feel for its effectiveness by checking how the service works with YouTube, BBC iPlayer and Netflix. Hotspot Shield gave us speedy access to geoblocked YouTube clips, without any hassle at all. That's good news, although also no great surprise, as YouTube is relatively easy to unblock. BBC iPlayer is better protected and usually more of a challenge. Not for Hotspot Shield, though, which allowed us to stream content exactly as usual. Netflix goes to great efforts to block VPNs and is normally the most difficult streaming site to access. But once again, Hotspot Shield performed well, allowing us into US and UK Netflix without difficulty. Hotspot Shield doesn't exactly highlight its P2P policy. There's no mention of this on the front page of the website, most of its feature lists or the opening page of its FAQs. Dig a little deeper, though, and you'll discover some good news. The service fully supports P2P on all servers, so once you've connected with any of the clients (Windows, Mac, Android or iOS), you're ready to start downloading. The support site has a few simple guides for beginners, with advice on why you might want to use a VPN for torrenting, and pointers on How To Download Torrents Anonymously. Whatever method you're using, Hotspot Shield doesn't have any bandwidth limits or restrictions, so you should be able to use the service as much as you like. Sign up for Hotspot Shield and you're redirected to your web console, where you'll find download links for Windows, Mac, Android and iOS clients, along with the Chrome extension. If you're hoping to find instructions for setting up connections manually, on routers or other platforms, you're going to be disappointed. Hotspot Shield used to support standard protocols such as OpenVPN, but you're now only able to use its proprietary 'Catapult Hydra' technology. The company claims this is worthwhile, quoting speed increases of up to 2.4x over long distance connections, but as nothing else supports Catapult Hydra, you can only use the service with Hotspot Shield's own apps and clients. These apps and clients are, at least, easy to install and use. The Windows client set itself up much like any other application, while the mobile apps and Chrome extension can be found and installed from their relevant app stores. Log in with the user name and password you created during signup and you're ready to explore the service. Follow the instructions and you're connected to the service within a very few seconds (Hotspot Shield connects faster than most VPNs). The On/ Off button shrinks in size and floats to the top of the panel, a map appears underneath showing your new virtual location and IP address, and a couple of figures keep you up-to-date on the total amount of data you've uploaded and downloaded. It all looks great and is very well presented. Clicking the current location displays a list of other countries you can choose from. This is a simple menu with no information on server distance, load or ping times, no option to choose locations within a country, and no Favorites system or 'Recently used' list to speed up reconnecting. The list is relatively short at 29 countries, though, and as choosing a location switches servers so quickly - around three seconds on our review system, significantly faster than most VPNs - Hotspot Shield is still very speedy to use. Hotspot Shield's settings dialog is equally simple, with very few options. It still covers the bare essentials, though, with switches to run the client when Windows starts, prevent IP leaks and enable a kill switch to block internet access if the VPN drops. There's one welcome bonus feature in the client's ability to automatically connect to Hotspot Shield when you access unsafe wifi hotspots, safe hotspots or all networks. That option isn't available nearly as often as we'd like, and it's good to see it here. The client's Help option is another plus. Instead of simply opening your browser at the Hotspot Shield support site, it displays key FAQs within the client interface (Can't Connect, Can Connect But Can't Browse, and so on.) You can get step-by-step advice in a click or two, and if that doesn't help, a Contact button opens your browser at Hotspot Shield support's Live Chat page for some professional assistance. The Hotspot Shield Android app has much the same clean and straightforward interface as its Windows cousin. Open the app, click Connect, and your current location is displayed on a small map. Tap the location name (or the map) and you'll notice a useful extra. While the Windows client always reconnects initially to whatever server you were using last, the Android app can be set up to connect to the fastest server for your current location. Scrolling down the screen reveals another handy option in the ability to automatically protect the traffic of specific apps. Add your required apps to the list and Hotspot Shield will automatically connect whenever they need to go online. There are bonus tools to scan for malware and extend battery life (the app used to have a Bitdefender-based malware scanner, but this seems to have been dumped.) These have some value, but don't appear to be doing anything particularly advanced, and you can get very similar capabilities from a host of free Android maintenance apps. A Settings panel also follows much the same pattern as the Windows client, with options to start when your device boots, or to automatically turn on Hotspot Shield for particular network types (secured, unsecured, mobile.) There's no integrated kill switch setting, unfortunately, but you do get a battery-saving extra in the ability to turn off the VPN when your device is sleeping. We're glad to see the Android app also has embedded help documents from the Hotspot Shield site, allowing you to get guidance on common issues from within its interface, rather than simply opening a support website and leaving you to find the relevant articles on your own. There's not a lot of power or configurability here, then, but the Android app is certainly easy to use, and its ability to automatically choose the best server is a welcome advantage over the Windows client. Hotspot Shield's iOS app is another close interface match for the other clients, with little more than a connect button, a world map and list of locations, and a very few settings. As usual, the iOS version has a touch more visual style than the desktop competition. Once you've hit the Connect button, the app doesn't just highlight your current location on the map, it also leaves it pulsing, gently. That makes it easier to spot your location at a glance, and conveniently, it looks great, too. What you don't get is much in the way of functionality. The 'optimal server' connection option you get with Android isn't available here, and you're left to select a specific country as your default location. We quickly spotted another annoyance when the app demanded we give it a rating. That's not uncommon, and we expect it from free or trial apps, but not when we've purchased a relatively expensive commercial app, and it pops up within a few hours of installation. Overall, the iOS app looks good and is straightforward to operate, but it's hard to see why it doesn't have an option to connect to the best server for your location, especially as Hotspot Shield has already demonstrated it can do this with the Android app. Many VPNs offer browser extensions, but they're usually very basic, stripped-back tools with little more functionality than a Location list and a Connect button. That's not the case with Hotspot Shield, though-- its Chrome extension is stuffed with features, and more powerful in some ways than the desktop and mobile apps. The opening interface gives no indication of this, as it looks much like the other clients: a mostly-empty dark panel with a Connect button in the middle, and barely anything else. Point, click, and you're connected. It's a near instant connection, too, because the browser extension is a simple proxy system which protects your browser traffic only. That won't work in every situation, but if you're mostly interested in unblocking websites, it could serve you very well. The extension gets more interesting when you tap the Configuration button, top right. For example, you're finally able to set a default server which you'd like Hotspot Shield to access when you first connect, or have it automatically connect to the nearest server. There's also a problem, in you only get access to a relatively few servers - Canada, France, Germany, India, Netherlands, Russia, Singapore, United Kingdom, United States - but the extra control is still a welcome plus. There are a bunch of privacy extras, starting with ad, cookie, tracker, malware and WebRTC blockers, along with a handy option to ignore any resources you're accessing which are hosted within your local network. Perhaps the best additions are the Auto Protect and Bypass lists, at least once you've found them (they're in Chrome's Hotspot Shield Settings page rather than the extension console). Add websites to the first and Hotspot Shield will automatically turn itself on whenever you try to access them, convenient for instance if you need the VPN to use them in full. Add websites to the Bypass list and Hotspot Shield will direct them through your regular connection, rather than the tunnel, handy for sites which don't work with a VPN, or which need to see your real location (a streaming platform which is only available in your country). This isn't quite as powerful as it looks, initially. The ad blocker isn't as capable as the market leaders, for instance, and doesn't have any settings or options to customize how it works. Still, overall it works very well, and the Chrome extension is better than most of the proxy competition. Although it's barely advertised on the website, Hotspot Shield also has a Firefox extension. This looks and works in almost exactly the same way as the Chrome extension, with just one minor omission (it doesn't include an optional Sword Mode for feeding web trackers fake browsing information.) Otherwise it's just as capable and easy to use as the Chrome version, and is a welcome addition to the Hotspot Shield lineup. If Hotspot Shield isn't working for you, the various apps give you instant access to advice on common issues by embedding documents from the website. As usual, if your issue is more complex, you can head off to the support website for more in-depth guidance. A web-based Support Center organizes its articles by platform, as well as categories like Payments and Subscriptions, Manage Account and Common Issues. There is some useful information on the website that you won't always get elsewhere (release notes of all the latest apps, for instance), but otherwise there are relatively few articles, and most of those are lacking in detail. There's nothing here to compare with the web guidance you'll get from providers like ExpressVPN. If you can't find an answer in the knowledgebase, Hotspot Shield claims to offer 24/7 chat support for Premium users, but that's far more difficult to access than usual. The problems continue with the apps. Choose Help in the Android app, select an article and click the Contact button, and a web form opens where you can enter the details to raise a support ticket. But do this in the Windows client, and it tries to take you to a chat page. We say 'try' because the chat page refused to load on our default Chrome browser, but when we tried loading the same link into Microsoft Edge, the chat window quickly appeared, reported that we were first in the queue, and we were talking to a friendly and knowledgeable agent in under a minute. Hotspot Shield does have some quality support available, then, but it's far more difficult to access than we've seen with any of the competition. Here's hoping the company works to improve this situation, and soon. Hotspot Shield has its issues - basic apps, no OpenVPN, a little logging - but if raw speed is your top priority, its turbo-charged performance could justify signing up all on its own. Take the 7-day free trial and see how it works for you.